In this video you can see how soft, shiny and bouncy our client’s hair is after a nourishing Kerasilk treatment. Vanessa also used, an Olaplex pre treatment to improve the strength of the hair prior to the Kerasilk smoothing. 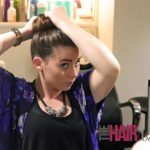 If you want to see more of our work, be sure to follow us on our Instagram page https://instagram.com/hairboutiqueexeter.